The not-quite-romantic comedy Roman Holiday introduced the world to Audrey Hepburn, and to Vespa scooters—though only one of those things was subsequently honored with a U.S. postage stamp. (It was Audrey.) Roman Holiday won Oscars for Hepburn’s performance, for its story, and for its costumes, and was nominated for seven more, including Best Picture and Best Director for William Wyler. It also kickstarted a new era of American movies being shot in Rome—“Hollywood on the Tiber,” the trades called it—and has been a beloved classic ever since. Here are a dozen graceful facts about it. 1. ONE OF THE BIGGEST STARS IN THE WORLD SHARED BILLING WITH AN UNKNOWN. Gregory Peck already had 18 films and four Oscar nominations under his belt when he was paired with Audrey Hepburn, a newcomer who’d had small roles in a handful of movies but nothing substantial. Given his status, it’s no surprise Peck’s contract called for solo top billing in the credits. But shortly after shooting began, Peck called his agent and said Hepburn’s name should appear with his above the title. The agent: “You can’t do that.” Peck: “Oh, yes I can. And if I don’t, I’m going to make a fool out of myself, because this girl is going to win the Oscar in her very first performance.” So maybe he was being pragmatic more than generous, but still. Stand-up guy, that Peck (and a bit of a prophet, too). 2. THE DIRECTOR DELAYED PRODUCTION TO WAIT FOR HEPBURN. William Wyler, at this point an eight-time Oscar nominee and two-time winner (for Mrs. Miniver and The Best Years of Our Lives), had good instincts. He knew Hepburn was perfect for the role of Princess Ann as soon as he watched her screen test in the fall of 1951, and was unconcerned about her relative lack of film experience. But Hepburn almost immediately became unavailable, starring in Gigi on Broadway starting on November 24. Wyler’s solution? Wait for her to finish. Paramount execs, equally enthusiastic about Hepburn’s screen test, supported the plan, even though nobody knew how long the play would run. It ended up closing on May 31, 1952; shooting on Roman Holiday began 23 days later. 3. HEPBURN CRIED REAL TEARS IN THE FILM BECAUSE THE DIRECTOR YELLED AT HER. 4. THAT’S A REAL SCREAM OF SURPRISE WHEN PECK PRETENDS TO GET HIS HAND BITTEN OFF, TOO. He perpetrates this dad joke in "The Mouth of Truth” scene, where you stick your hand in a statue and it gets bitten off if you’re a liar. (It doesn’t work in real life, by the way.) The script called for Peck to briefly pretend his hand was being chewed off, but he took it one step further, hiding the hand in his jacket sleeve and pulling out the “stump” to horrify Hepburn. Wyler and Peck would both later claim credit for this idea, but their accounts were in agreement that part of the fun was not telling Hepburn beforehand what Peck was going to do. Poor Audrey. 5. IT WAS SHOT IN BLACK-AND-WHITE NOT BECAUSE WYLER WAS OLD-FASHIONED, BUT BECAUSE PARAMOUNT WAS CHEAP. The studio wanted to make the film on its own Hollywood backlot, but Wyler wouldn’t budge on shooting on location in Rome. Paramount finally agreed, but only if Wyler could finance it with “blocked funds” (a percentage of money that Paramount’s films had made in Italy that could only be spent in that country). When that only amounted to about $1 million, Wyler cut costs by shooting in black-and-white. He would later say that he didn’t even think about color until he was in Rome and it was too late, but in fact he’d always wanted to shoot in color, and had said as much months before production began. 6. THE WRONG SCREENWRITER WON THE OSCAR. Ian McLellan Hunter was credited as the writer, but he was fronting for Dalton Trumbo, who’d been blacklisted for not cooperating with the communist-hunting House Un-American Activities Committee. (Hunter wrote a subsequent draft, too, but never claimed to have been the screenplay’s originator.) When Roman Holiday won the Oscar for Best Motion Picture Story (then a separate category from Best Screenplay, for which it was also nominated), it went to Hunter, who had refused to attend the ceremony. In the early 1990s, the Writers Guild of America and the Academy Awards people posthumously returned the credit and the awards to Trumbo. 7. IT ALMOST STARRED CARY GRANT AND ELIZABETH TAYLOR, AND FRANK CAPRA ALMOST DIRECTED IT. The director of such sentimental classics as It’s a Wonderful Life and Mr. Smith Goes to Washington almost made Roman Holiday in the late 1940s, and he supposedly had Grant and Taylor ready to star. (This would have been icky: Taylor would have been about 16, Grant about 44.) But Capra balked at the low budget Paramount proposed (some sources say he was also wary of having anything to do with a script written by a Communist), and he sold the project back to the studio in 1949. 8. IT HELPED VESPA SELL A TON OF SCOOTERS. The Italian motor scooter Vespa had been around since 1946 and had sold well in its native land. But Roman Holiday introduced it to an international audience, and did so in a manner so appealing that all the money Vespa had could never have bought such advertising. Not only does the movie show a beautiful woman and one of the world’s most beloved actors having the time of their lives as they ride a Vespa around Rome, that image was even featured on the movie poster. Little wonder the company sold 500,000 Vespas between 1953 and 1956, matching the number it sold from 1946 through 1952. 9. IT’S HOW GREGORY PECK MET HIS SECOND WIFE. Peck’s marriage to the former Greta Kukkonen was an unhappy one at this point, and there were many rumors of his dalliances with other women. Still, they remained together for the sake of their three children, and the whole family went to Rome together. On the way there, however, at Paramount’s request, Peck stopped in Paris to do an interview. The reporter was a lovely young woman named Veronique Passani. 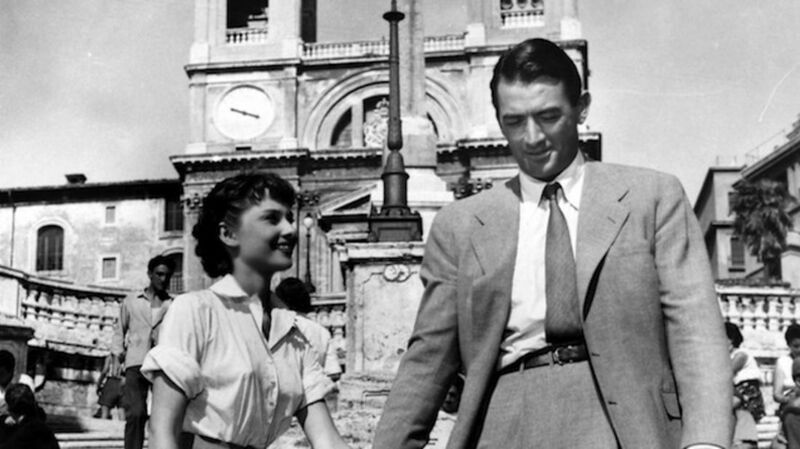 She visited Rome to interview Peck again during the shoot, and Wyler said that’s when the two fell in love (though Peck always maintained it wasn’t until later). Whatever the timeline, Peck and Passani were married on December 31, 1955, shortly after his divorce from Greta was finalized. They remained married for the rest of Peck’s life. 10. IT’S ALSO HOW AUDREY HEPBURN MET HER FIRST HUSBAND, INDIRECTLY. Hepburn and Peck became lifelong friends through Roman Holiday. It was at a cocktail party at Peck’s house after the film’s release that Hepburn met actor Mel Ferrer, whom she subsequently married. They had one child together before divorcing 14 years later. 11. THERE WAS A REMAKE. THERE’S A GOOD REASON YOU DON’T REMEMBER IT. On December 28, 1987, NBC aired a TV movie version of Roman Holiday starring Catherine Oxenberg (from Dynasty) and Tom Conti (from British TV and the David Bowie film Merry Christmas Mr. Lawrence). It was poorly received (“one of the more embarrassing duds of a decade,” said The New York Times) and no one ever spoke of it again. Until just now. 12. AUDREY HEPBURN WON AN OSCAR FOR HER PERFORMANCE, THEN LOST IT. Misplaced it, that is. At the ceremony in March 1954, she was so excited and overwhelmed by the win that she took the wrong route to get to the stage, gave a breathless speech, and then left the trophy in the ladies’ room. She and Oscar were soon reunited, however, and lived happily ever after.